Fever is not a disease , but symptoms of a disease. For example, because of cough, runny nose, sore throat, diarrhea, other infections of the gastrointestinal tract, and respiratory infections. 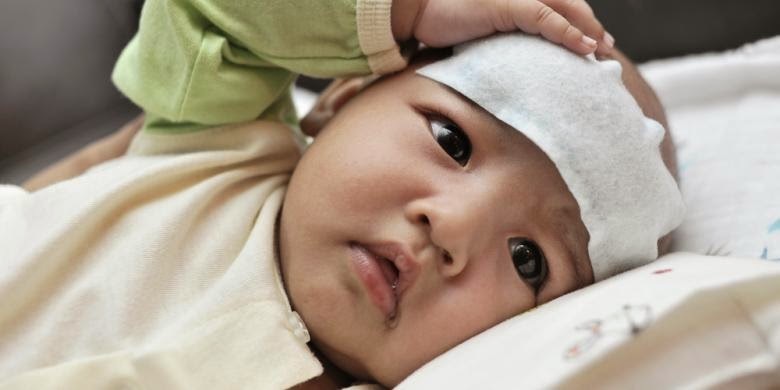 Most parents quickly panic if their children (especially infants) had a fever. You must remember that fever is the body's mechanism against a disease or infection is usually caused by viruses, bacteria, and so forth. Son said the fever when the body temperature above normal threshold (greater than 37.2 degrees Celsius). This fever appears that the body temperature slightly hotter than usual and sometimes with chills. Infection in children is usually caused by viruses or bacteria. Examples of fever when the child is suffering from flu or virus pilek.Adanya this, the child's body is naturally resistance. Antibiotics do not kill viruses, so antibiotics are not the flu drug. You do not need to give antibiotics in children with fever caused by a virus or due to the flu. In general cases, body temperature heat will help prevent the spread of the virus. If this is your child's body temperature is below 39 degrees celsius, no seizures, children are not too fussy, and vomiting. Regularly monitor the body temperature using a special thermometer for children. Giving fluids in sufficient quantities to children to avoid dehydration. Consuming a balanced nutrition to strengthen the immune system of children. Noting the circulation of the room, so as not stuffy. Giving fever-lowering drugs, when a child's temperature exceeds 38 degrees celsius. When the body temperature is normal, administration of the drug was discontinued. Compress child with warm water, especially when a child's body temperature reached 39 degrees celsius.Kompres could be placed on the forehead, abdomen, or folds of the armpits and warm paha.Air make peripheral blood vessels in the skin dilate and open pores occurs sooner tubuh.Sehingga evaporation. Children wearing clothes absorb keringat.Apabila yng shivering child, the child was covered, but soon released again when menggigilnya lost. Immediately bring the child to the doctor if the fever does not go down soon.